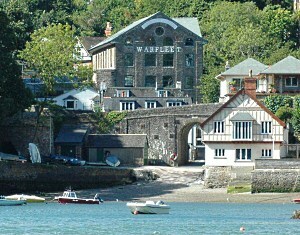 The pottery lies in a secluded area of the town on Warfleet creek, near the mouth of the River Dart, only 40m from a tidal slipway. The apartment features a secure 25 foot garage, large enough to store boats, surf boards etc, making this an ideal location for sailing, fishing and scuba diving. This local landmark building has recently been renovated to the highest standard, retaining many attractive architectural features. The apartment is a spacious one-bedroomed duplex layout, sleeping up to 4, set over 2 floors. Large open plan living room, with large 6 to 8-seater corner sofa. Wireless Broadband, TV, Sky box, DVD player, HiFi. Fully-equipped kitchen with fridge, freezer, microwave, dishwasher. 6-seater dining area. Large carpeted bedroom, with a king size oak bed and additional large day bed, en-suite bathroom. Separate shower room and laundry, washer/drier and ample drying space for your gear. Combines modern style and artwork with old features of the original building. To book our luxury self catering holiday apartment for short breaks and holidays in Dartmouth please check our availability page, or contact us on the contact page.